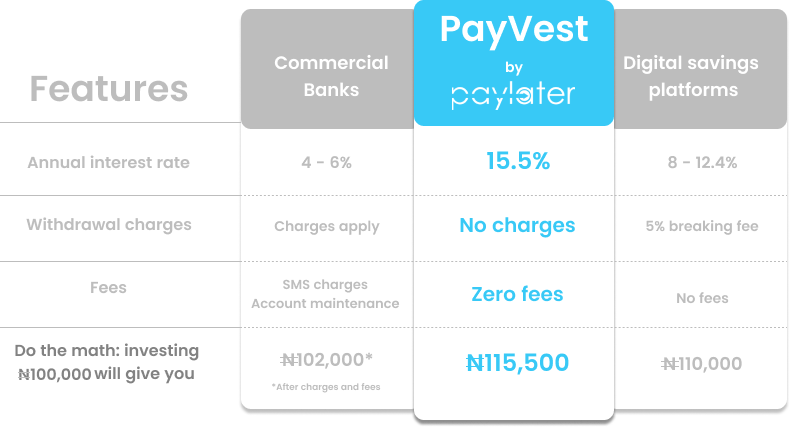 Paylater, a consumer lending startup in Nigeria, has launched a new product: “PayVest: a fixed-interest investment account.” This product can pay an interest rate in the range of 15.5% per year. With annual interest rates of up to 15.5%*, you’ll struggle to find anything (legal) that matches PayVest’s return on investment. It’s comfortably above the inflation rate, thus ensuring you’re only ever earning money and not losing it. Single investments can range from N50,000 to N10 million. In my last piece about this company, I noted that it could work with entities like Piggybank, an online saving portal, to pioneer new sectors in the Nigerian financial sector. I noted that these companies are competitors and also coopetitors, and together these entities can redesign our financial system. The thesis of my point is this: Piggybank is a saving startup, and Paylater could borrow from it to make loans since Piggybank has cash from its savers. Of course, there are regulatory reasons why the startups cannot handshake at this level. Nonetheless, for Paylater to continue to grow, it has to find CHEAP capital. Without cheap capital, its scalable advantage will drop. Paylater is pioneering a new area in fintech along with other lending startups in Nigeria. Though their annual interest rates can vary from “31% to 213%”, for most people, it is better than nothing. Simply, they are meeting the needs of customers, left behind by banks. For the very fact that they are CBN regulated, it means that they have to disclose every element of their loan terms in ways that customers will understand. With PayVest, it is working to fix that problem. Simply, if the PayVest vision works, Paylater will receive “investment” deposits from customers which will cost it up to 15.5% yearly. It will then take that money and lend to customers at above 31%. Just like that, the company has fixed a big challenge which is having enough money to lend. Also, with this structure, it may not need to take expensive capital from say banks. You see why the move is brilliant: PayVest will anchor a virtuoso circle which will make it possible that the Paylater system can support itself organically provided it continues to manage risks well. This is what most hedge funds in U.S. do: they have reinsurance/insurance businesses which help them with cheap capital. Warren Buffett does same with Geico, an insurer, where he gets cheap capital from premiums and then use that capital to invest in long term deals. If you can control both arms, get cheap capital, invest with bigger spreads, you have a winner anytime. PayVest has just raised capital for Paylater in the way great companies do: your customers FUND you. Yes, customers are the best investors.